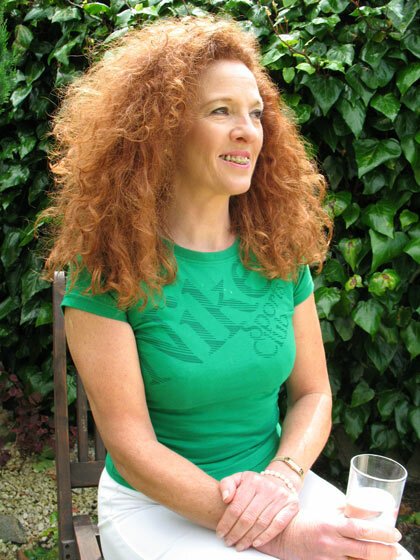 SusieB DipIHS (cbd gummies for sale Holds a recent diploma in Nutritional Therapy) in Ireland and is a member of NTOI (Nutritional Therapists of Ireland) and also studied in London with Patrick Holford at ION (Institute of Nutrition) in the 1990ai??i??s. She is a One to One Personal Trainer and a member of P.E.A. (Physical Education Association) England and I.E.T.A. 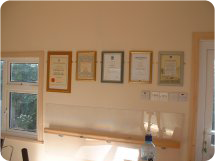 (Irish Exercise Teachers Association) and holds many certificates in nutrition and fitness ranging from 1984 to date in both England and Ireland and has extensive experience working in Gyms for the last 30 years. Former Professional Dancer during 1980-2006. Former Athlete who ran for Dublin during 1970ai??i??s. Writes health and fitness articles for local newspapers. Motivational Drop in:Ai? ?Tailor made training using a heart rate monitor for fitness testing to suit the individual and nutritional therapy combined to meet optimal health. Followed on by Motivational Drop In sessions for 45mins-1 hour Cost: ai??i??30Ai? ?Look out for monthly special offers. Classes Range from ai??i? ?6 (funded) up to ai??i? 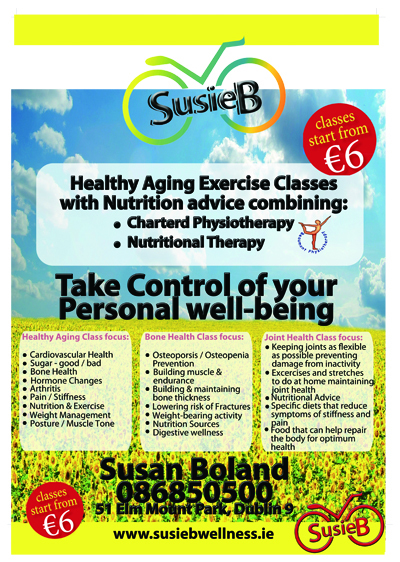 ?20 depending on size of class and venue location (Santry, Beaumont and Donnycarney and more venues to come) Group Exercise class: Cost 5 sessions for ai??i? ?100 Provides nutritional therapy/exercise take home programsAi??andAi? 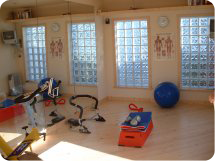 ?chartered Physiotherapy. Pain management, providing exercise and diet that may help reduce overall Inflammation that includes pain and stiffness. Check out our news and twitter feeds for up and coming dates and times. Short sessions with toning exercises for posture correction/muscle balance and weights for bone health run by a charted Physiotherapist and Nutritional therapist. Ai?? 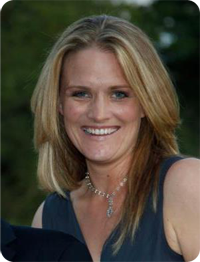 With Orlaith Buckley – Chartered Physiotherapist:Ai??Ai? 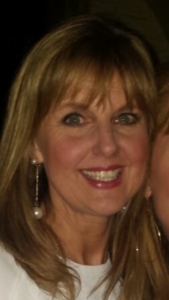 ?”I am delighted to work with Susan Boland on a Joint Assessment/ Review of her clients. As a physiotherapist, with 17 years experience, I look forward to advising Susan and her clients on fine tuning their programs & making them specific to their individual needs. With a wide range of experience in the NHS, HSE and a wide range of sports, I look forward to adding my knowledge to Susanai??i? ?s, in order to get the very best results for our clients”. A handout will be provided or e-mailed to you with physiotherapy type exercises relative to you. Karen Byrne RGN Ai?? Ai?? Ai?? Ai?? Ai?? Ai?? Ai?? Ai?? Ai?? Ai?? Ai?? Ai?? Ai?? Ai?? Ai?? Ai?? Ai?? Ai?? Ai?? Ai?? Ai?? Ai?? Ai?? Ai?? Ai?? Ai?? Ai?? Ai?? Ai?? Ai?? Ai?? Ai?? Ai?? Ai?? Ai?? Ai?? Ai?? Ai?? Ai?? Ai?? Ai?? Ai?? Ai?? Ai?? Ai?? Ai?? Ai?? Ai?? Ai?? Ai?? Ai?? Ai?? Ai?? Ai?? Ai?? Ai?? Ai?? Ai?? Ai?? Ai?? Ai?? Ai?? Ai?? Ai?? Ai?? Ai?? Ai?? Ai?? Ai?? Ai?? Ai?? Ai?? Ai?? Ai?? Ai?? Ai?? Ai?? Ai?? Ai?? Ai?? Ai?? Ai?? Ai?? Ai?? Ai?? Ai?? Ai?? Ai?? Ai?? Ai?? Ai?? Ai?? Ai?? Ai?? Ai?? Ai?? Ai?? Ai?? Ai?? Ai?? . Karen a Registered General Nurse and Bone Densitometrist works closely with Susan providing bone density checks in between biannual DXA scans. 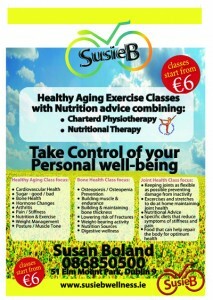 This will enable you to monitor your progress with Susan’s treatment 6 monthly. Karen uses the Sunlight Miniomni Scanner, a non invasive ultrasound machine which identifies osteopenia/osteoporosis. Osteoporosis means porous bones. Osteopenia is the early stage of osteoporosis. Osteoporosis is a silent disease which is not usually diagnosed until you break a bone. Most people have no pain until a fracture occurs. In most cases it can be prevented and it is a treatable condition. Early diagnosis will provide the best results. From our 40′s onwards our bones gradually lose bone density as a result of ageing. Certain diseases/conditions including: Thyroid, Coeliac, Crohns, Eating disorders, Ai?? Ai?? Ai?? Ai?? Ai?? Ai?? Ai?? Ai?? Ai?? Ai?? Ai?? Ai?? Ai?? Ai?? Ai?? Ai? ?Rheumatoid arthritis, Impaired mobility. Listen to Susie on Near FM, 90.3 every month, featuring nutrition and exercise tips. Log onto the station website and and click podcasts, then look for "Life Line" radio show where you can hear previous interviews.